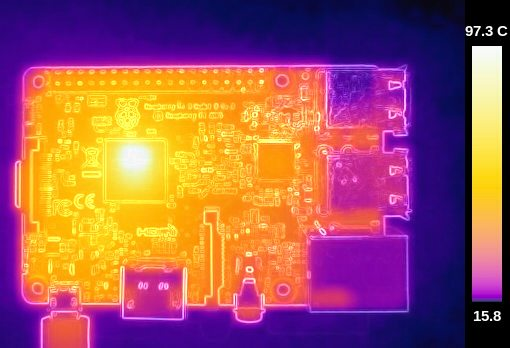 The Pi3 has been pushed to it's manufacturing limitations, and it runs hot. With the Pi3, if you are expecting to get any kind of performance out of it, you are gonna need to set up some kind of cooling. My Pi3 desktop (I am partial to the Windows layout and "Start" buttons, and i like to switch between visual themes...I have three themes, Raspbian, Kali, and Veil) If you are gonna turn the Pi3 into an overclocked Desktop PC, make it look awesome! Right? The easiest way I have found is get an oversized heatsink, and fan.... Cpuburn-a53 is designed to heat up the pi3, and I can run it with ease overclocked @ 1.3 Ghz, and thermals never exceed 50C. I can run Stress at 38C, Sysbench at 37C, and Idle at 26C... Whether you are overclocked or not, If you have an overheating issue, this is how to resolve it. 1.3 GHz overclock failed on Linpack, so arm overclock reduced to a more stable 1.26 GHz. The heatsink pictured below is custom machined for me by a friend (I have two of them), and is made of anodized aluminum. The outside dimensions are L.87" x W.96" x H.70", and the centered 'socket' on the bottom is L.66" x W.66" and .010" deep. The cooling fan is 12v 70mm x 70mm x 10mm, and sells pretty much everywhere for around $4 - $7 or so. It runs quietly on the GPIO 5V rail. Is the 12v fan quiet? Does it efficiently cool the pi3? Fan Push or Pull, which is better??? Overclocked "Hot Rod Pi3 Extreme"
GPU memory is set to 192 (gpu_mem=192) which seems to provide the best performance if using the pi3 as a desktop with monitor. Why should you care if your overclock is stable, or not? Unstable overclocks can eventually lead to premature hardware failure, malfunctions, crashes and data loss, as well as sdcard corruption. If your Pi3 should freeze up, or otherwise become unresponsive during tests, DO NOT remove power, instead reboot with 'alt'+"sysrq"+"b" ('sysrq' is also known as 'prtscr' key). Hard reboots (where you unplug power, then plug it back in again) can result in data corruption! Two things before you start, make sure you have the proper power supply, and some kind of cooling capability... fan and/or heatsink (preferably both). (test the hdpharm and read/write performance of your hc-1/uhs-1 micro sdcard). Average is 50 MHz 20 MB/s Read; 12 MB/s Write, or with sd_overclock 100 MHz 40 MB/s Read; 20 MB/s Write. average stock Pi3 benchmark total time is 119.4716 seconds (faster is better). CPUBURN-A53: ! !Run cpuburn-a53 with caution if your pi3 insufficiently cooled!! (Test is "PASSED" if you do not throttle back, or exceed 79C within a 15min span. Exceeding 79C, and overheating/throttling, OR Pi3 crash indicates a "FAIL". Will also verify whether your power supply is adequate or not). A properly cooled pi3 can run this between 50C-79C. (tests stability, performs computations, if you overclock, and it is flawed, test will fail or crash. set 'gpu_mem" to 48 prior to test for optimal results). Stock Pi3 at 1.2 GHz passes this at 6 Gflops (may require a small voltage boost in /config.txt "over_voltage=1"), a stable overclocked Pi3 at 1.26 GHz passes at around 6.6 Gflops (multiple back to back tests with same Gflop result to determine stability). got  700MB (734003200 bytes), trying mlock ...locked. Last edited by Rive on Sun May 15, 2016 12:28 pm, edited 186 times in total. Re: [Solved] Pi3 overheating no more. Cool!!... (pun intended)...now we know what a hot rod extreme pi looks like. Updated with how to install and run the following benchmarks and tests to check stability, cooling, and performance of the Pi3, and how to disable screen blanking, and configure and enable lock screen options using light-locker. Building a BOM for heatsink and fans for UK based people. 23x23mm, a lot larger than 15x15mm of the CPU, will it fit fine? 12v, it will fit, but pricey. Also worry the inrush current may be too much to use the 5V header on the Pi. Thoughts? Any other good sources to buy HS&F? loadbang wrote: Building a BOM for heatsink and fans for UK based people. As for the fan current, should be fine. It isnt gonna run it at 12V...it will run it at 5V (or you can even try the 3V header). It is a tiny fan (25mm x 8mm)...approx 1/3 the size of the fan I use (70mm x 10mm @ approx 0.2 A), what are you mounting it on? If you compare your specs (L .91" W .91" H .39" ) to the specs of the one in this image (L .87" W .96" H.70"), you will notice is only slightly longer. You may want to reconsider though, as the height is not much and thus provides less of a cooling area, which may render it less effective. 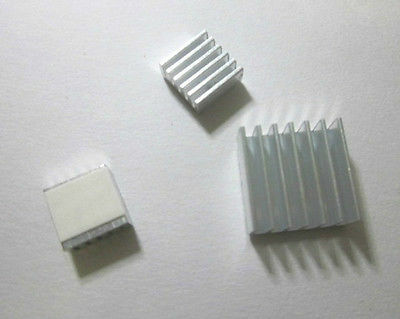 Imagine the heatsink in image shown below as more rectangular (instead of square)...slightly longer (+.04"), less wide (-0.5"), and less then half as high (-0.31"). There is room, so you can make the length work (if you offset it forward a little towards the USB/Ethernet). Measure the area around the SoC and see. L .87" W .96" H.70"
the experiment did not reach 'steady state' as temperature is continually rising but much more gradual compared without heatsink. throughout the 14 minutes, i've got 4 concurrent linpack processes crunching 1000x1000 matrices non-stop and it does not throttle the frequency, frequency remains at 1.2Ghz for all that 14 minutes of intensive computation. then to further achieve 'steady state' i'd think a fan is needed. however, for the occasional high (concurrent parallel) loads i'd think passive cooling is still a rather sensible solution. echo "freq => $(/opt/vc/bin/vcgencmd measure_clock arm)"
For me a synthetic benchmark is a short program that doesn't solve a real problem. In a way solving a randomly generated system of linear equations is synthetic and takes about 100 lines of C code to fully implement. The fact that linear algebra computations occur in scientific computing has led to a multi-vendor effort to write performance-optimized code. The result typically runs 10 to 100 times faster but also takes significantly more lines. In this case hpl is around 34 thousand lines and after including the OpenBLAS subroutine library totals 3 million. Given how much performance improvement can be achieved, already optimized subroutine libraries are convenient when comparing the performance of computer hardware. In addition to video encoding, another area where optimized subroutine libraries exist that could be used for benchmarking computer hardware is encryption. Note, however, that many of these algorithms were actually designed with the instruction sets of certain CPUs in mind, so the comparisons aren't always as fair. Currently most Pi 3's are running a 32-bit version of Raspbian that is binary compatible with the single core ARMv6 architecture. While such code runs slower than software optimized for the multi-core ARMv8 architecture, the advantage is that a heatsink is often not required to prevent throttling. This one reformats the measure_temp output to display in Celsius and Fahrenheit. This one for executing tests and grabbing the temps/clock without using an infinite loop. Last edited by DonJuan692006 on Sat Sep 09, 2017 9:34 pm, edited 1 time in total. It's only about halfway to the script I'm using. Hey Rive, don't want to jack your thread, but it's the one that consistently comes up when searching for Raspberry Pi cooling. I set out on a quest to find a similar heatsink and managed to find one from here that fits and has supporting test data to show it's actually an efficient cooler. I was concerned with clearance between the bottom of the cooler and the board, so I picked up a hunk of copper from this fleBay sale. The surface of the plate was pretty wavy, so, after I cut out a 30x30mm chunk, I spent some time (read as about 3 hours) following the lapping process and got it pretty flat. I used Arctic Alumina thermal adhesive to fix the plate to the heatsink and then the heatsink assembly to the CPU. I've ran some tests and I'm pretty happy with the results. I'm using a LEGO case I built to help with funneling the air from my fan, more on that in this thread.